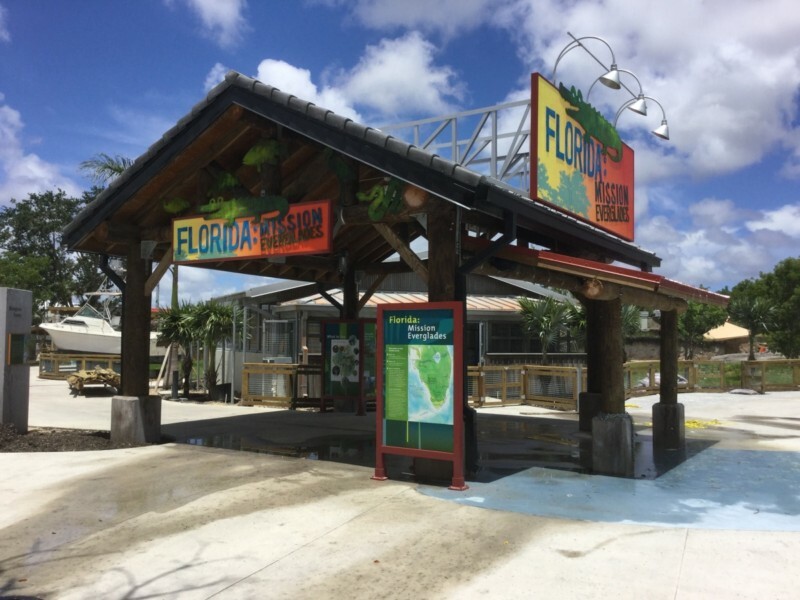 ABOVE PHOTO: The shaded entrance to Florida: Mission Everglades incorporates a “Florida thunderstorm” wet play feature that creates a playful way for people to learn about the importance of fresh water conservation. Opened in December 2016, Florida: Mission Everglades is an interactive zone at Zoo Miami, centered around Florida’s Everglades ecosystem. Through architecture, design and experience, Florida: Mission Everglades gently asks guests to consider what choices they can make in their lives to help protect and preserve this rich, natural habitat. 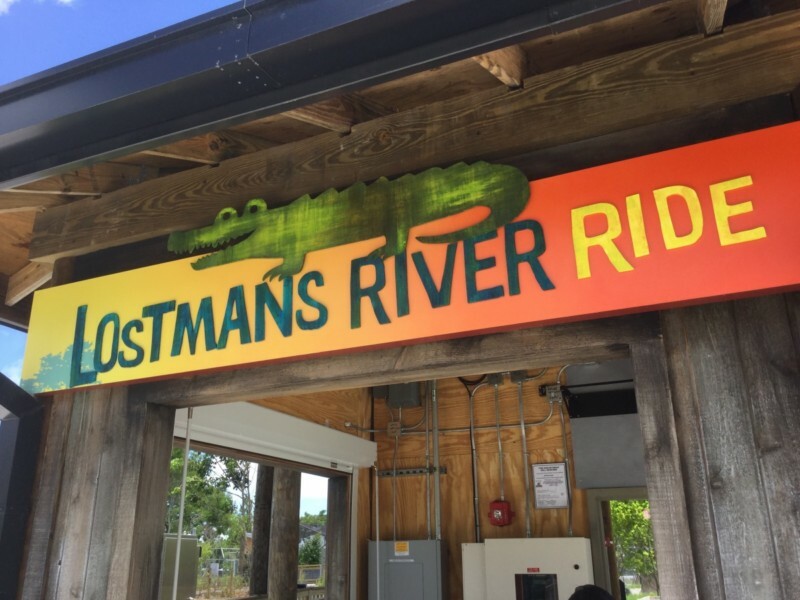 • Lostman’s River Boat Ride: Guests board a boat and float through Everglades habitats providing up-close access to native plants and animals. 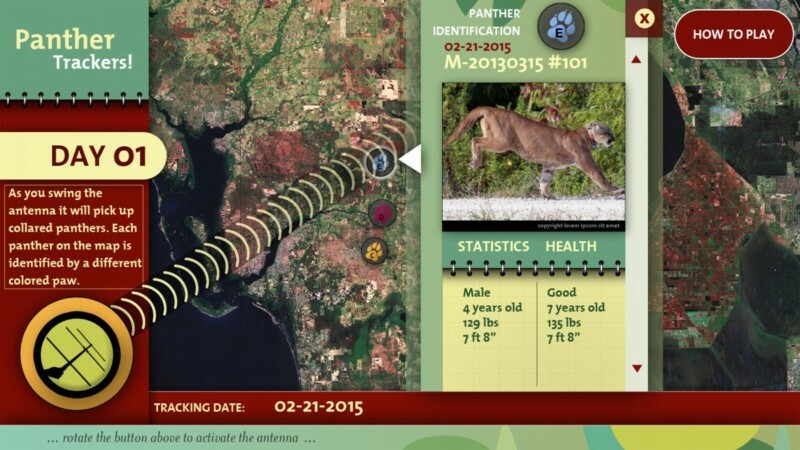 • Panther Tracking Experience: Utilizing GPS tracking technology used by Florida Fish & Wildlife, and “gamification” techniques, guests see how real panthers move around in the wild. 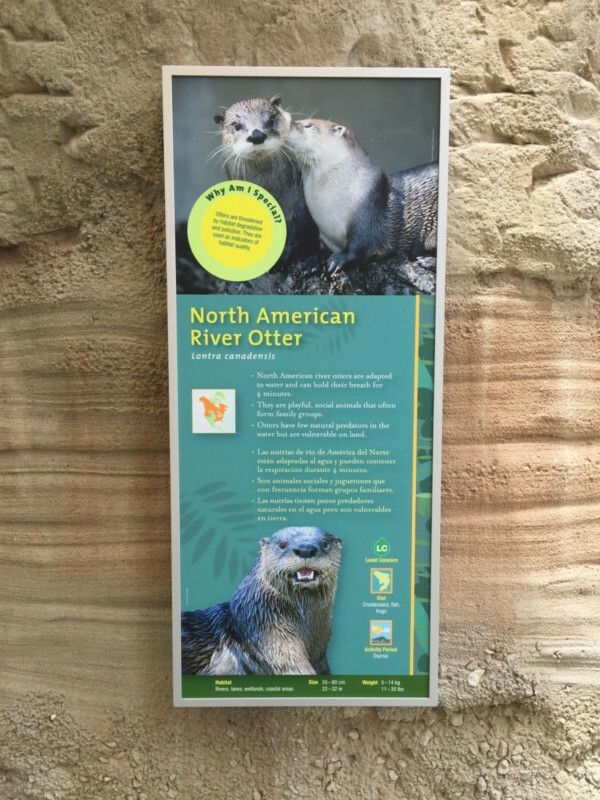 • River Otter and Crocodile Play Zones: By way of clear acrylic tunnels incorporated into the exhibits, guests can crawl alongside real crocodiles and slide through an otter sanctuary, while the creatures play and splash nearby. • Thunderstorm Wet Play Area: Designed as a play area for toddlers, a periodic, simulated thunderstorm splashes water below while reminding guests of the importance of rain and fresh water to the Everglades ecosystem. “This is museum-quality, interpretive content within a fun, themed environment,” said Michael Mercadante, President of Main Street Design. “As museums and zoos embrace themed entertainment, we are able to leverage our experience in all these markets for our clients.” Main Street Design has over 25 years of experience designing for zoos, aquariums, museums, theme parks and attractions. Mercadante himself has served in leadership roles within the Themed Entertainment Association (TEA) and Association of Zoos and Aquariums (AZA). Essential Florida habitat types are identified with distinctive touchable environmental graphics. In developing exhibits, Main Street Design worked closely with zoo designers PJA Architects to fulfill the project vision while ensuring the well-being of the animals. Barriers are nearly invisible, and visitors are able to get close to the animals and their habitat. The animals are neither specimen nor entertainer – the encounter and habitat design respect their needs and support their natural behaviors. As a result, the zoo’s educational mission and story of environmental conservation and species preservation are strengthened. 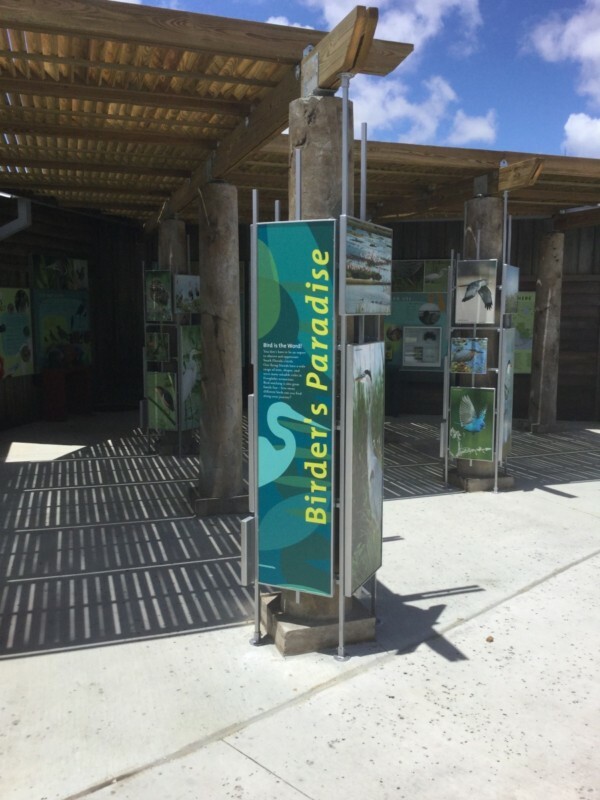 Birder’s Paradise exhibits introduce key Florida bird species, and celebrates regional birding opportunities. “Main Street Design helped develop content that provides a small glimpse into the world of the Everglades and creates in our guests a spark of curiosity to go and visit the real Everglades National Park,” said Kruse. In addition to PJA, Main Street Design partnered with AECOM (architecture and engineering) to help bring the project to fruition. 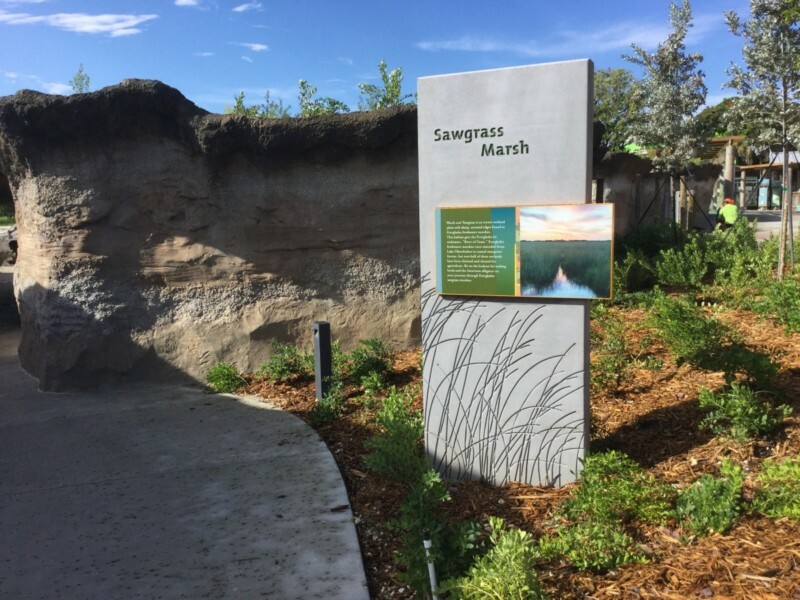 “This team, under the leadership of Zoo Miami, really understood how experiences found in museums, technology from theme parks, and conservation messaging are converging across the industry, but especially here on the Florida: Mission Everglades project,” said Mercadante. 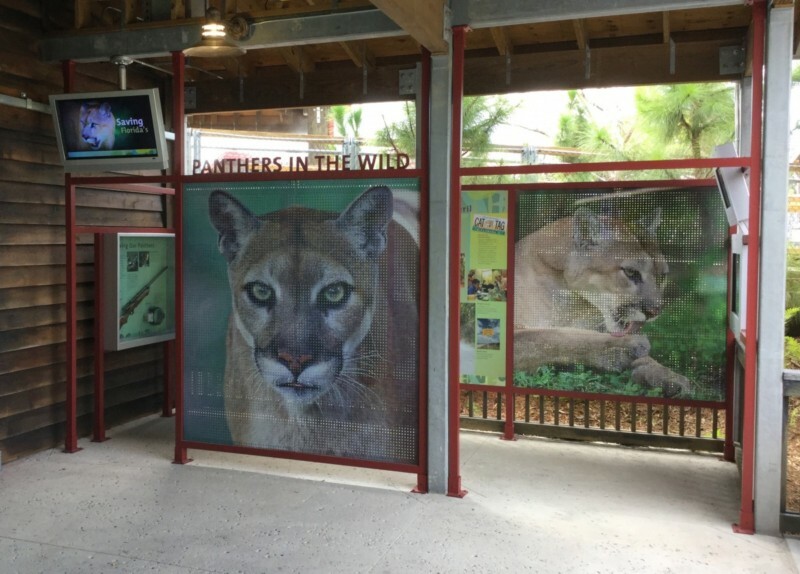 The Florida panther enclosure includes a shaded viewing area along with an interactive multimedia “panther tracking” activity. Main Street Design is an award-winning interpretive planning and exhibition design firm that specializes in creating place-based experiences that engage guests in active, open-ended explorations of complex subject matter. For over 25 years, Main Street Design has focused its practice on the interpretation of natural history and cultural heritage themes, and in particular, on subjects and projects where those themes intersect and overlap. Whether they are working in an interior visitor center environment, or outdoors, at a park or preserve, they are drawn to stories and settings where landscape, climate and biology have influenced culture and where the history of human interaction with the natural world has something to tell us about ourselves and our surroundings. Main Street Design has completed over 200 planning and design assignments for visitor centers and museums, nature centers and wildlife reserves, zoos, aquariums and botanic gardens, and select corporate clients.